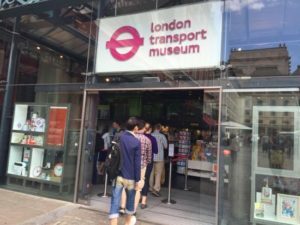 London Transport Museum has upcoming ‘Early Explorers’ mornings for families with children with additional needs, on Saturday 27th October, from 8.30 to 10.00am. Please see link below to flyer for further details. Later in 2018 we will be running another Early Explorers morning on Saturday 15 December, from 8.30 to 10am. For this 90 minutes only, London Transport Museum will be open with the majority of sounds switched off, for you to explore in peace and quiet. This is a rare opportunity to explore our Family All Aboard Playzone while the Museum is quiet. We will have available our sensory ‘Explorer Bags’ especially developed for children and young people with additional needs as well as an object handling table for those who would like to find out about ticket machines and other smaller parts of our collection. Exclusively for October’s Early Explorer morning, join us to commemorate the end of the First World War in 1918. Find out about the huge changes that people in London and transport went through. Get an exclusive opportunity to climb on board our Battle Bus which is not normally available to visitors. Tickets are charged at the standard Museum rate and can be booked in advance by calling 020 7379 6344. Carers are permitted free access and children and young people under 18 also go free but do still need to book in advance.